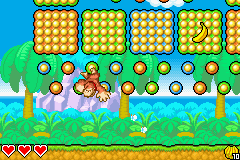 Banana Bungalow is the first level in DK: King of Swing and of Jungle World. Since it is the first level, Banana Bungalow is considered the easiest. It only features basic Peg Boards and only one Flitter for an enemy. This level is the grounds for the Jungle Jam Tournament. Unlike most levels, Banana Bungalow does not have a DK Medal. The first part of the level has no enemies, and only features plenty of Bananas and Peg Boards. Donkey Kong can reach a platform at the end that leads into the second section. This part features some stationary single Pegs mixed with Peg Boards. At some point, Donkey Kong can choose from three Peg Boards, all of which lead to a different path but end up at the same location. A single Flitter is located shortly before the level exit. Donkey Kong can charge int it for the level's Crystal Coconut. Banana Bungalow has nine Bananas in its first half, and another nine in second half, totaling to 18 Bananas. The Flitter of Banana Bungalow. This page was last edited on April 5, 2019, at 12:45.